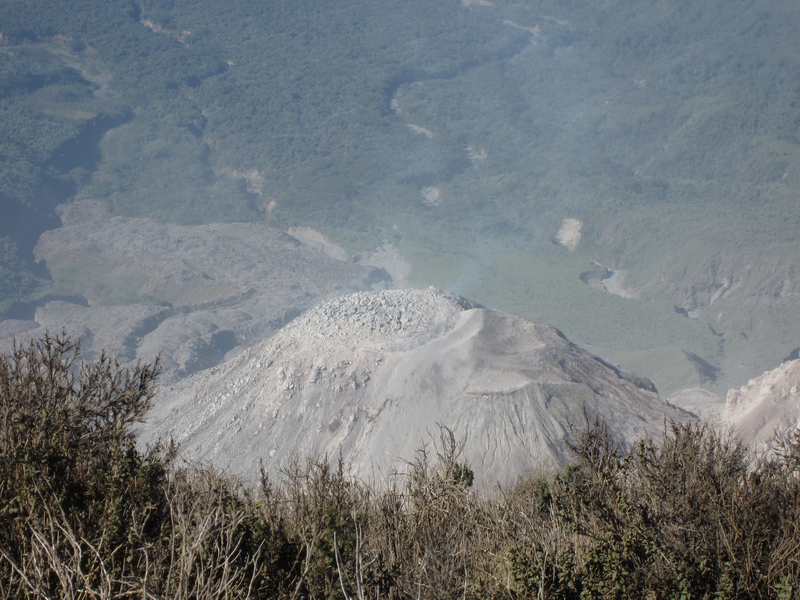 Around 10:30, five hours after starting our hike up the dark and slippery path of the Santa Maria Volcano we had finally arrived at her pointed peak. 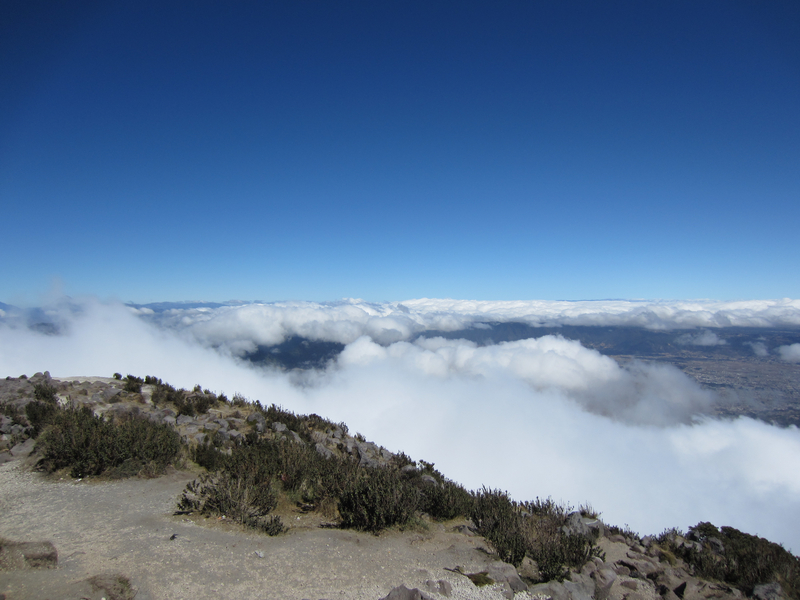 The clouds had started to form and blanket the valley of Xela thousands of miles below. 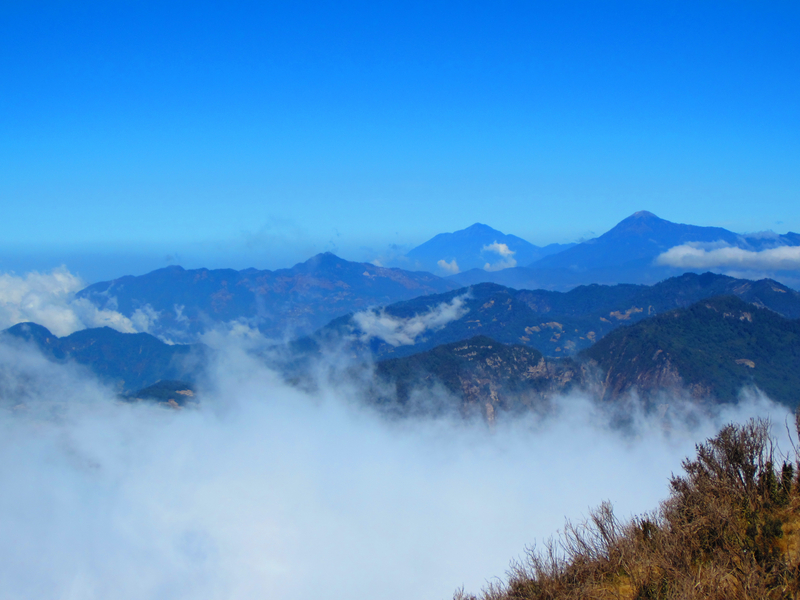 Yet fortunately they hadn’t fully conquered the peak. 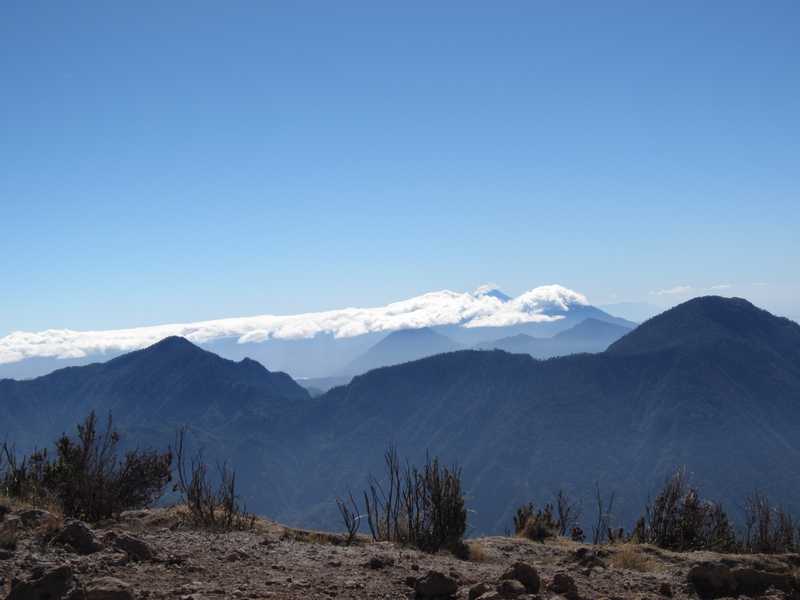 There was still a spectacular view of the surrounding volcanoes and valley beneath. As we approached our resting spot for an early lunch I was perplexed by a low humming sound. 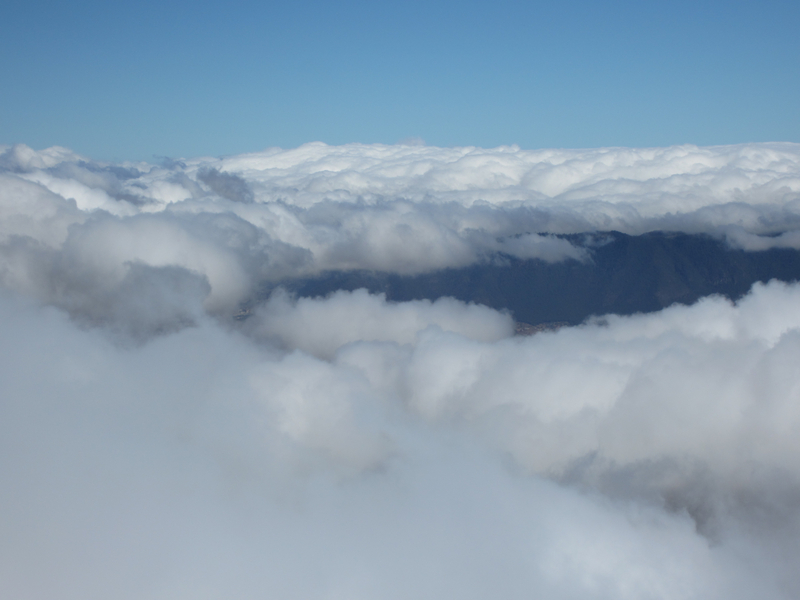 The sound of voices, high and low, big and small, filled up the empty open space around me. As we come closer to the noise I realized with amazement that it was a human chain of chanting. The Mayans were singing their prayers to their gods. The voices of their chants flowed smoothly together making a monotonous tone at times, entrancing me and captivating my soul. Although I don’t see myself as a religious person, I was completely in awe of the beauty of the Mayans prayers. I could have stood there watching them and letting their melodic, rhythmic prayers relax my soul. Yet to stand and stare would have been extremely rude. So I gave them their space and followed my guide Lico over to the southern edge. Just as I was about to take out my sandwich I heard the first unusual, mysterious sound. This time it wasn’t being made by man but by nature. The rumblings started as a low, distant grumble and quickly became more intense and loud. 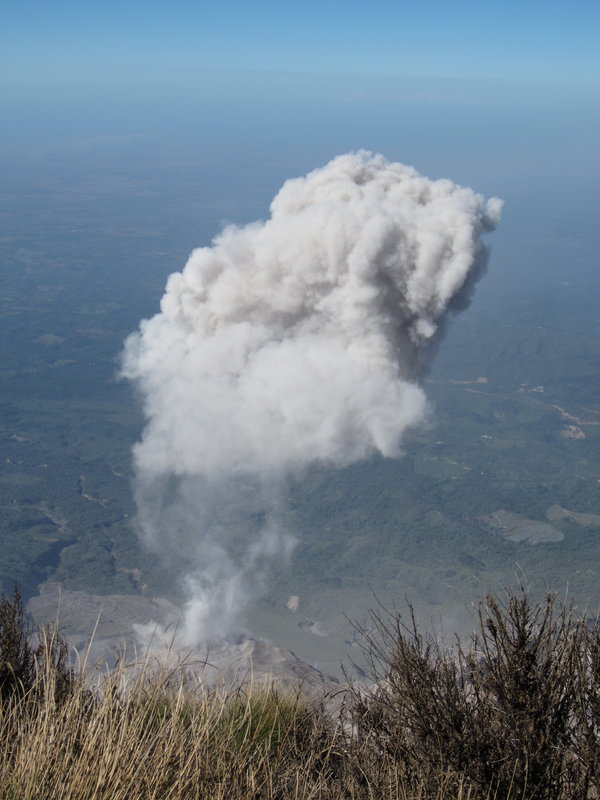 To my complete amazement, a few thousand feet below us lay an active volcano, Santiaguito, which was beginning to erupt. 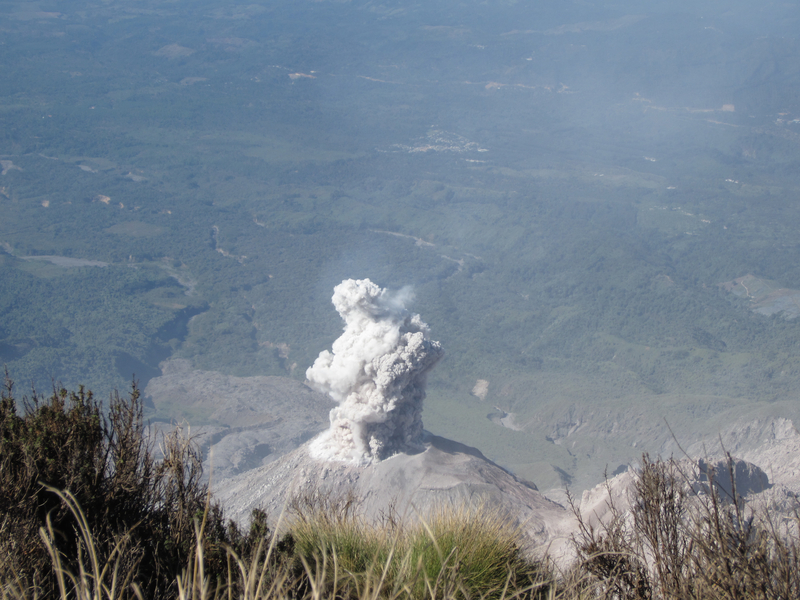 The active volcano awaits….Santiaguito (2,488m) on Santa Maria’s southwest flank. 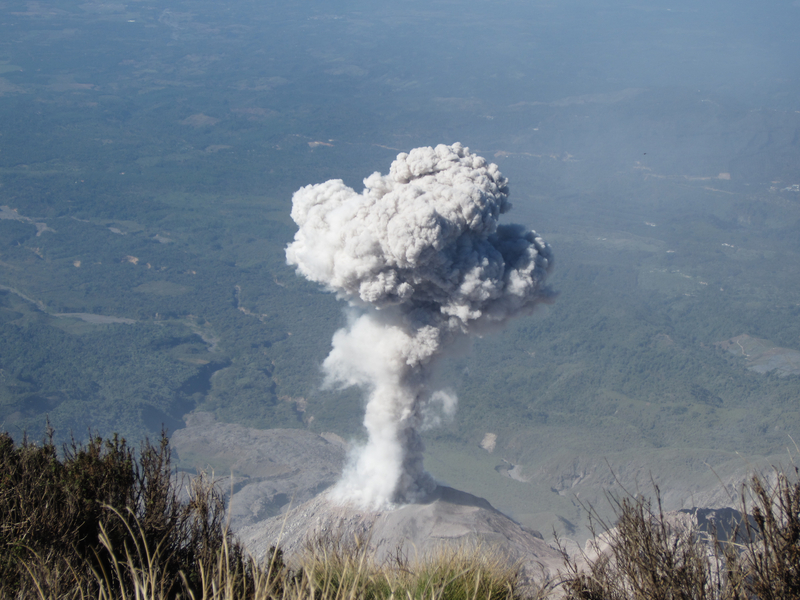 Should I have been worried that Santigauito’s 1902 eruption was the fourth largest eruption of the 20th century? 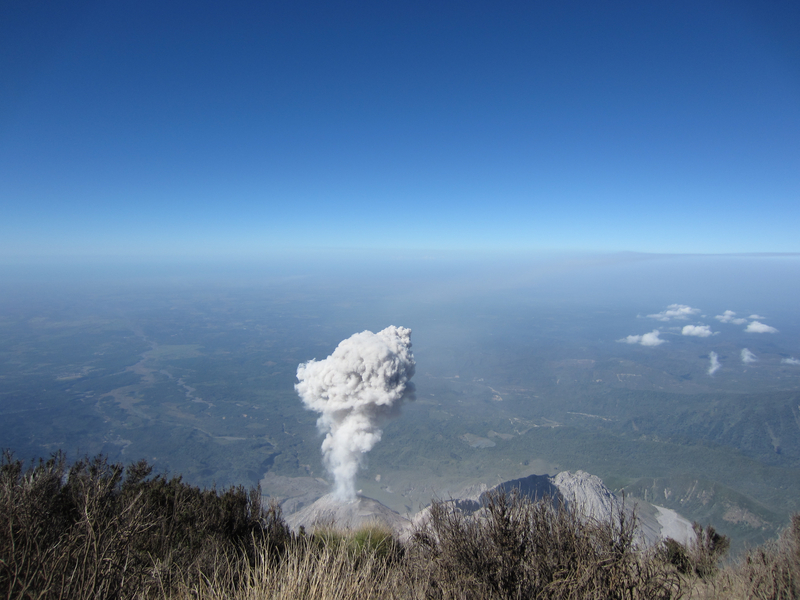 Here are the photos I took while the eruption unfolded (if only I knew how to use my video feature on my camera!) Notice also that I was playing around with different settings which explains the variation in color and vividness of the scene. 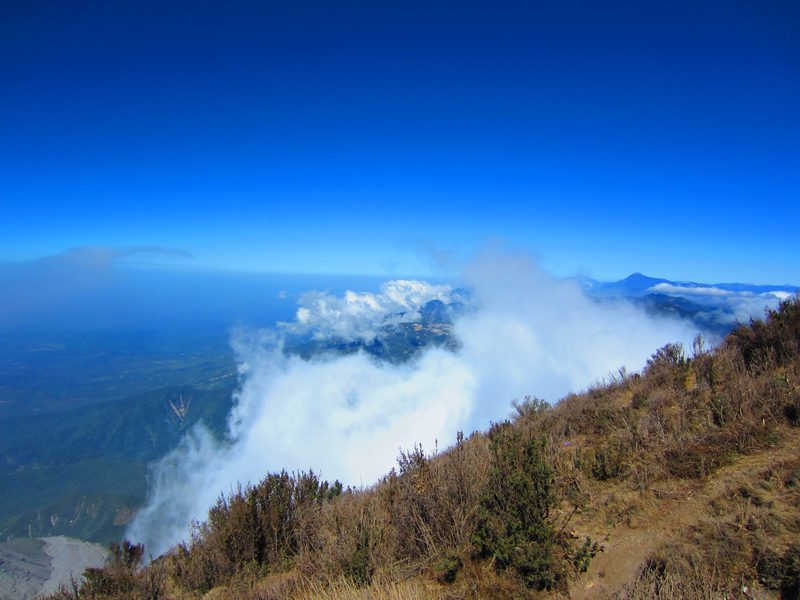 Here is my first sight of Santiaguito from my perch on a rock atop Santa Maria volcano. I had no idea that this baby was going to erupt so you can imagine my complete shock, surprise and delight when it did, right before my eyes. After the first low rumblings, a tiny little burst of ashes arose….slowly into the sky. 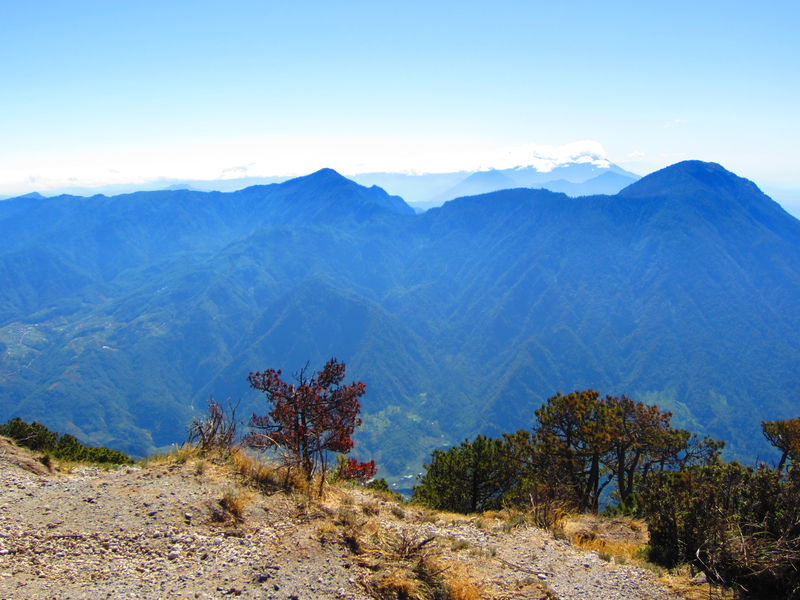 Off in the far distance you can see the ocean which is only an hour and a half drive away from Xela. The perfect plumb…I think this one is my favorite! 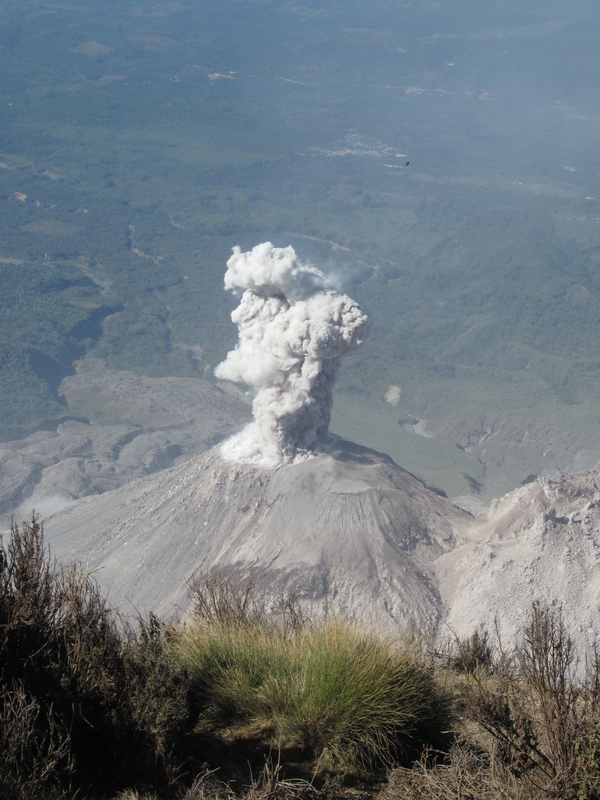 After a final last plumb of smoke drifted into the air, I captured this last photo of the volcano’s magical eruption. Wow. For once in my life I was utterly speechless. And just as quickly as the eruption came, it left and the wind picked up dragging the ash and smoke off into the distance as if it had never been there at all. Then, there was silence. No chanting. No words. Nothing. Except utter peace. Stay tuned…the last post in this series is on the descent where Lico and I end up trailing the Mayan group for a bit and witness their pilgrimage. Great pictures for a spectacular adventure, thanks for sharing! Thank you so much for your comments! I am glad you enjoyed them! I know I took a ton but couldn’t help it. I had to capture every moment of being there! Holy Moly! This is absolutely incredible! I don’t know what else to say, Nicole. These photos are stunning. I can’t even begin to imagine how it must have felt to witness this. What a fabulous post! FP material, my friend. Oh Kathy! You are always my cheerleader when it comes to great comments! I am so glad you enjoyed the post. I truly loved your recent one on turning 50. Can’t wait to see what you write next! Thanks! It was pretty wild! It really looks amazing, so much thanks for sharing! Thank you! So glad you enjoyed it! Wish I was there again. I love hiking and being outside in the middle of a mountain! Awesome pics Nicole! Now I REALLY wish I’d gone with you!!! Can’t wait for more posts! I really want to do the one near Antigua that has the red lava! Ohhh….wish you were still going to be living there but then again, now I will have an entire new place to visit! Also, can hardly wait to see your photos from the next week! Wow, I wonder how many you will take! You mean Pacaya! I have no idea how the lava is at the moment. It’s constantly changing. New places to visit are always good! You may have to wait a while for me to do more blog posts on Semana Santa as it takes me so long to go through them all afterwards. I’m not a blogging machine like you are! I’m impressed at how many blog posts you’ve been getting out! what a incredible sight to see! Thanks for the reblog! I really appreciate it! Glad you enjoyed the post and pictures! Wow! What a wonderful experience. It sounds magnificent even without the eruption but the volcano really got its timing right for you! Bet there aren’t many mountain experiences to top that one. Thanks for sharing the photos with us. Wonderful! Thanks Anna! Yes it was pretty surreal. I guess the volcano erupts every 30-40 minutes! I had no idea when I booked the hike. So I was completely taken off guard. astonishing photos – and a great read too! Thank you! I sure enjoyed it! Want to do it again! This is amazing! I wish I’ll get the chance to see that too one day! Thanks! It is pretty easy to get there….! What an experience! 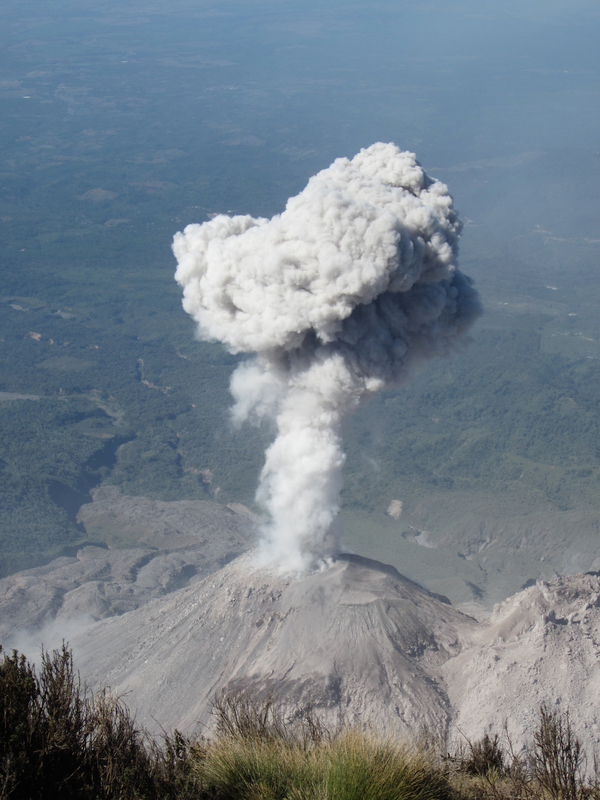 What are the odds of you traveling somewhere while watching a real volcanic eruption? So slim I guess. Great photographs too, Nicole! What an utterly fantastic experience! It’s great that there are volcanoes, like this, that let out “little burps” so that we mere humans can watch and appreciate them. Obviously, catastrophic eruptions, those really spectacular ones, are best watched on tv… wouldn’t want to get quite so up-close and personal with those mammas! 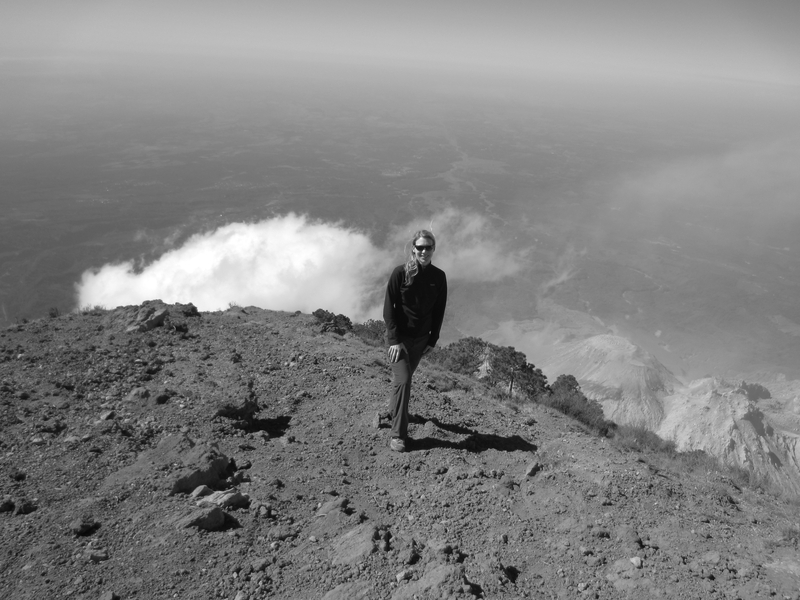 The one volcano that I saw erupting (in Chile) roared like an angry lion… and I mean ANGRY!! Lu, you would love Guatemala and Costa Rica given your background. You must try to make it there!!!! I’m glad it was a little eruption, that looked dangerously close! It’s amazing how peaceful it looks in the first picture, before the plumes of ash. I’m a huge fan of volcanoes so I have to confess that I’m extremely jealous – seeing one erupt is right up there at the top of my bucket list. Beautiful photos, Nicole! Thanks James! I appreciate your comments! It is funny now looking back I wonder if I should have been the least bit nervous that it was so close….! That is amazing to see!!!!! Yes! I still want to see the red lava though…NEXT TIME! Amazing! I can’t believe that they allow people to hike there if it is so active, how exciting. Yes, it is crazy! 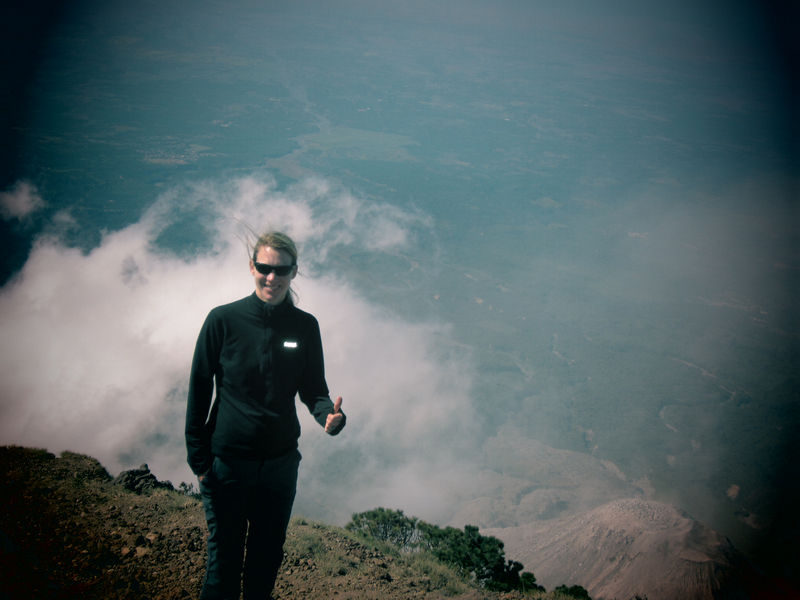 You can actually do some hikes on volcanoes with red lava…wish I would have done that! Maybe next time!